"Cores" redirects here. For other uses, see Core (disambiguation). This article is about the Native American tribe. For the rural community in New South Wales, see Coree, New South Wales. For the country, see Korea. The Coree (also Connamox, Cores, Corennines, Connamocksocks, Coranine Indians, Neuse River Indians) were a very small Native American tribe, who once occupied a coastal area south of the Neuse River  in southeastern North Carolina in the area now covered by Carteret and Craven counties. Early 20th-century scholars were unsure of what language they spoke,  but the coastal areas were mostly populated by Iroquois and Algonquian peoples. The Coree were not described by English colonists until 1701, by which time their population had already been reduced to as few as 125 members, likely due to epidemics of infectious disease and warfare. In the early 18th century, the Coree and several other tribes were allied with the Iroquoian Tuscarora against the colonists. In 1711, they participated in the Tuscarora War, trying to drive out the English settlers. The Native Americans were unsuccessful and suffered many fatalities. By 1715, some Coree merged with the remaining members of the nearby Algonquian Machapunga and Tuscarora people and settled in their single village of Mattamuskeet in present-day Hyde County. This was on the shore of Lake Mattamuskeet. Other Coree remained in Carteret county (especially in isolated areas such as Indian Beach, Atlantic Beach, Harkers Island- formerly known as Craney Island, Core Creek, and swamp lands). Descendants gradually married and assimilated into the European-American and African-American populations. Although in the 20th century, some people claim individual descent from the historical Coree, no revival of the tribe has been accomplished. Some observers believe that current attempts to claim Coree descent are by people who were among what anthropologists called " tri-racial isolates", often of majority European and African descent. On the other hand, the Coree occupied territory that was historically mostly that of Tuscaroras, which suggests they were affiliated with these peoples. The name Coree may be the singular form of the Carolina Algonquian name Cwareuuoc. ^ Mook, Maurice A. (June 15, 1944). 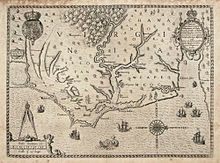 "Algonquian Ethnohistory of the Carolina Sound". Journal of the Washington Academy of Sciences. 34 (6): 181–228. Ives Goddard. (2005). "The indigenous languages of the Southeast", Anthropological Linguistics, 47 (1), 1–60. Ruth Y. Wetmore (1975), "First on the Land: The North Carolina Indians" .